In a perfect world, you’d be able to move out of your old home and into your new one before putting your old house on the market. But (sadly) this is the real world. So there’s a strong likelihood that you may need to keep living in your home while you’re selling it—along with all the stuff you need to actually live. It’s a delicate balance that nearly every seller faces. But there’s no need to worry: If you can’t store your belongings off-site and professionally stage your home, you can still make it look like you did. The key is hiding your junk, and hiding it well. Your first inclination might be to shove all your stuff into your home’s natural storage spaces—in closets, under cabinets, or in utility areas such as the laundry room or garage. But here’s the problem with that plan: Eager buyers, yearning for storage space, are going to peek in those very spaces. “Storage space sells homes, and you want home buyers to think you have plenty of it,” says Noelle Nielsen, a real estate professional with Re/Max Advantage Plus in Eagan, MN. Do you really want rolls of wrapping paper and boxes of old yearbooks spilling out onto potential buyers every time they open the front hall closet? No—and they don’t either. It will be a major turnoff because buyers want to know they’ll have enough room to store their stuff. In fact, stagers recommend that you clear out half of each closet to give buyers the impression of space. You want buyers to notice your house, not your random stuff. And the key to that is having less stuff to begin with. When I was buying my first home, I toured houses full of creepy doll collections; built-in bookshelves jam-packed with old magazines and older newspapers; and entire bedrooms almost entirely stuffed with boxes. What I remember about those homes is the clutter. What I can’t even recall are details about the number of bedrooms or size of the kitchen. So don’t just spend a couple of hours before the first showing tossing unwanted stuff in a donation pile. As soon as you decide you’re going to sell, take a thorough look at your stuff and try to see it the way a buyer would. And don’t just address the spots you can see when you first walk in. For example, “if there’s clutter above your fridge, organize it—or better yet, find a place to hide it,” Nielsen says. Or throw it out! Do you really still need that 10-year-old Emeril Lagasse cookbook? If you’re still living in the home, there will be some rooms you simply need to use every day. But there is a trick you can use to keep them seemingly pristine. “I tell my clients to act like they’re going to college,” Nielsen says. 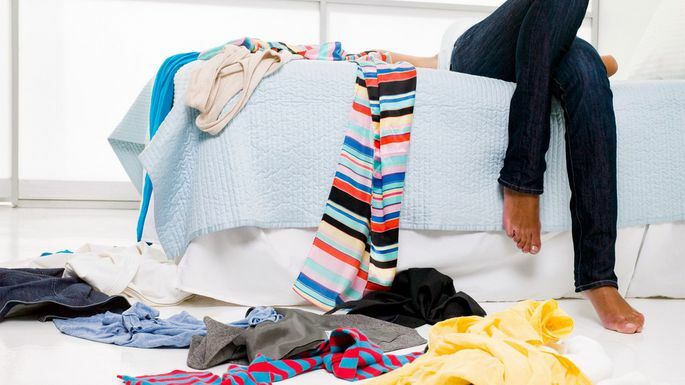 Starting with the bedroom, she recommends packing any clothes and shoes you’re not using now in suitcases and then store those suitcases neatly under the bed or in the closet. So, you’ve decluttered and donated and decluttered again. But you still have all this stuff. Where do you hide it where it won’t be discovered by would-be buyers? If you don’t have the means to rent a storage space, then think low and think high. Buyers aren’t likely to peek under your bed, behind the dresser, or in your attic. Make these your primary storage areas for knickknacks, seasonal items, and other bulk. In the kitchen, move your miscellaneous items and bulkier tools to the very back of the top shelf in your overhead cabinets, getting it out of the line of sight. For the lower cabinets, make sure dishes are stacked neatly and there’s plenty of space around each item. Store your coffee, food, and spices in wicker baskets, and place the baskets in the pantry. In the bathroom, pack up anything you don’t use regularly—like that extra set of curlers or the electric razor you haven’t touched since you started shaving. For everything else, invest in a couple of shower caddies. “When you have a showing, you can easily store the caddy under the sink,” Nielsen says. Just remember human nature: If buyers can peek inside a room, cabinet, or drawer, they probably will.